FOX Sports West, in conjunction with the Anaheim Ducks and Los Angeles Kings, announced on December 27, 2018 the broadcast plans for the second “Hockey Day SoCal,” set to take place on December 29, starting at noon. Highlighted by 10 hours of programming, the network will showcase three games, including Las Vegas Golden Knights vs. LA Kings, Arizona Coyotes vs. Anaheim Ducks, and the 16AAA Jr. Kings vs. Jr. Ducks. The themed day will be anchored by the “Hockey Day SoCal” set location at Anaheim ICE and a special hockey themed telecast launching the day at noon, the network will be back with “Hockey Day SoCal” updates at approximately 5:30 p.m.
Mike Pomeranz will host the program alongside Guy Hebert, who will offer analysis as they check-in with the “LA Kings Live” crew at STAPLES Center and “Ducks Live” crew at Honda Center throughout the day. Beginning at 12:30 p.m., “LA Kings Live” will preview the Golden Knights vs. LA Kings game from STAPLES Center. Hosted by Patrick O’Neal, Jarret Stoll and Derek Armstrong will deliver analysis before handing it over to; Jim Fox and Alex Faust who will then offer analysis and play-by-play, respectively. The Kings-Vegas broadcast on Saturday is also the next in the Hockey Night in LA series, a special matinee edition featuring Andy Lassner. 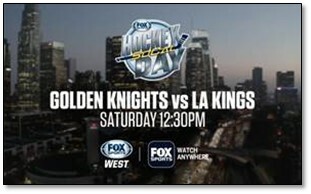 For the first time, FOX Sports West will feature the 16AAA Jr. Kings vs Jr. Ducks game. Originating from Anaheim ICE at 4:00 p.m. (tape delay from 9 a.m.), David Gascon will provide play-by-play, Hebert will offer analysis and Taylor Felix will supply reports and interviews. To round out the day at 6:30PM, “Ducks Live” pre-game will set up the Coyotes vs. Ducks game from Honda Center with host Kent French, analyst Brian Hayward and reporter Jill Painter-Lopez. Hayward will then join play-by-play announcer, John Ahlers in the booth. Coverage will conclude with “Ducks Live” post-game, recapping the best of the day from each location. In addition to telecast coverage on FOX Sports West, all games on the regional sports network will also be available on the FOX Sports App. The FOX Sports app, available to iOS and Android devices, provides live streaming video of FOX Sports content along with highlights and instant alerts for scores and key plays. Fans can download the mobile app for free from the Apple App Store and Google Play. Streaming on the FOX Sports app is also available on connected devices, including AppleTV, Android TV, FireTV, Roku and Xbox One. FOX Sports West is the local destination for the Los Angeles Kings, Los Angeles Angels and CIF Southern Section high school athletics. Together, FOX Sports West and sister networks Prime Ticket and FOX Sports San Diego present more live, local sports programming than any other network or broadcast system in the market. Serving sports fans in Southern California, Nevada and Hawaii, the regional networks produce over 900 live sporting events and telecast over 3,500 hours of live and original programming every year. For complete regional sports news, telecast schedules and more, visit FOXSportsWest.com.